Over many years, I have developed an interest in all of the variants of the Salisbury axles used in the XK line. Something I have searched the internet for was the missing link between the Salisbury 2ha and a North American equivalent. Not finding anything definitive, I started to look for likely candidates. Studebaker and Jaguar were similar sized companies that sourced a great many parts from other suppliers. 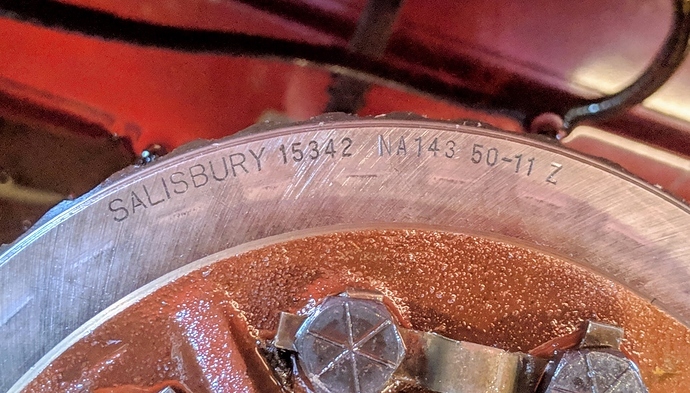 I knew that Studebaker trucks and OHV V8 sedans used a Dana 44 rear axle with 19 spline shafts and a 10 spline pinion, virtually identical to the Salisbury 4ha. I eventually found photographs that led me to believe that a 6 cylinder Studebaker might provide the missing link. So I found one out of a 1950 Studebaker sedan, bought it, and took it apart. What I found were a lot of Salisbury parts identical to the Jaguar 2ha equivalent. 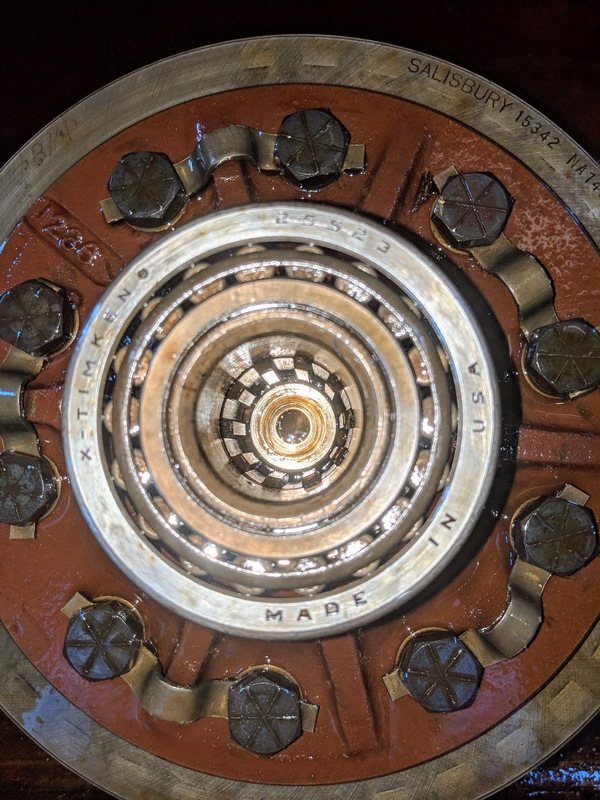 The bearings all had the same Timken part number, although they were labeled Made In USA, not England. The side gears are 10 spline, ala MK-V.
Ha, so you got that one in Michigan I was looking at? I guess your curiosity was stronger than mine. I could have driven to pick it up but I couldn’t spare the time. FIll us in more as you go. I for one am collecting info for the day when my Mark V axle will need work. the 1st Dana 44 was built during WW2 by Dana USA 1943! lot of info on WIKI! i can say this tho, my 1978 Jag XJS Power lok diff, all Dana 44 parts in it , including JEEP gears,3.73 . GM HD yoke, coupled to custom alloy driveshaft! 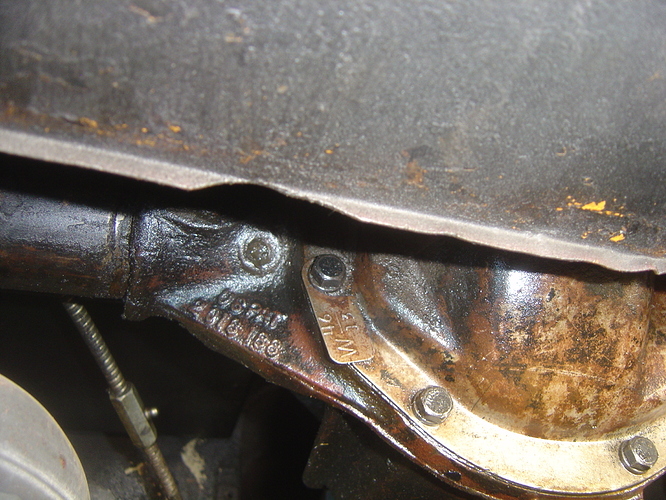 and for more interests, i wanted to put better LSD clutch disc’s in, some times my memory actually works ,seems i had seen those disc’s someplace else, back shop under an old bench, was a 1959 Corvette diff. Dana Corvette had 5 discs (one was a Bellville spring disc) all were thinner than Jag, OK they are still in the car 26 yrs later, burns the both tires evenly, can lock in corner anytime you heavy on the pedal! so i guess GM used some Dana stuff also! Yes, this was the one on eBay in Michigan. I spent $190 buying and shipping it. My rationalization was that I have spent more betting on a horse I knew less about, so this was a bargain! I did talk the guy into cutting the axle tubes and only shipping the center section, so at least it is not taking up a lot of space. I can make you a heck of a deal on a 2HA 4.55 ring and pinion! collecting info for the day when my Mark V axle will need work. If interested in Dana 44 axle bits, Willys utility wagons used 44 rear ends in the 4WD vehicles from about '46 - '62. A variety of ratios are available with new parts easy to source (4.27 and 4.09 and 5.38 are pretty common). For example, see https://www.kaiserwillys.com/category/axle/rear-axle/ring-pinion . Note on page 40 of Mark V spare parts catalogue that crown and pinion could be supplied with British or American thread screws for crown to differential case, depending on what differential case was in use on the particular Mark V.
Yes, my 3.5L Mark V has a 2HA with 4.27 gears, which is not the same as a Dana 44. I’m still unclear which Dana model number would be equivalent to a 2HA. One identifier is the rear cover, round on a 2HA, oval with straight sides on a 4HA. My '50 Willys had the 5.38s: GREAT in compound low, up in the hills, but at 55 mph, that little flattie four was screaming! I think they also were available in 4.88s. You can find the Dana 44 in LOTS of 1950’s, 60’s and 70’s stuff. Ford station wagon and sedan delivery, Ford pickup trucks, Dodge trucks, International Harvester, Jeep, on and on. 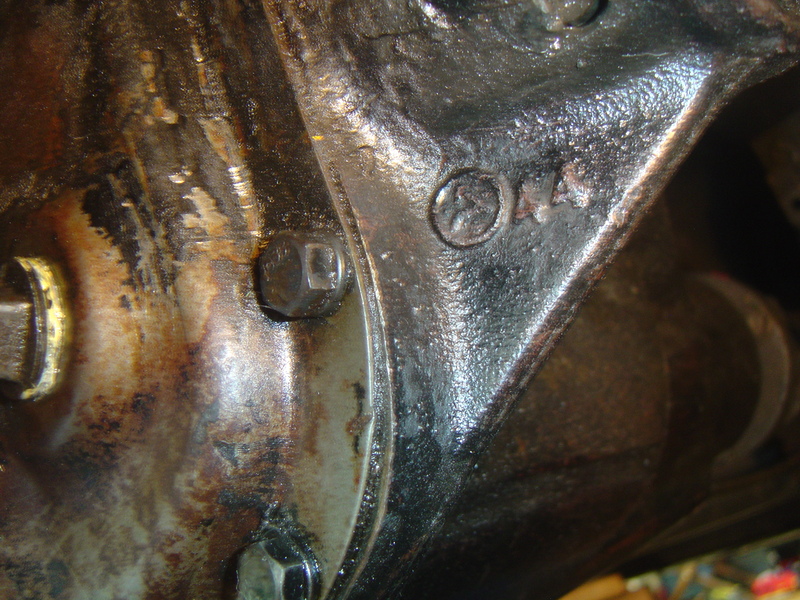 Dana 44 axle bits, Willys utility wagons used 44 rear ends in the 4WD vehicles from about '46 - '62. Sadly, that appears to be the case, at least based on my sample of one. Well, photos would help, particularly if you believe that it is not originally of Jaguar origin. 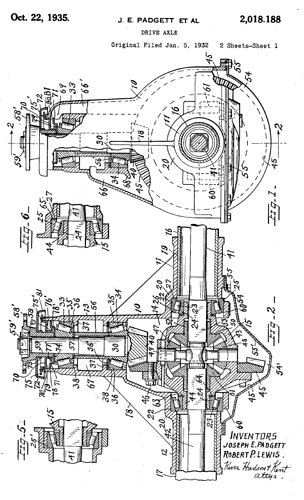 Are the axles 19 spline and the pinion 10 spline? 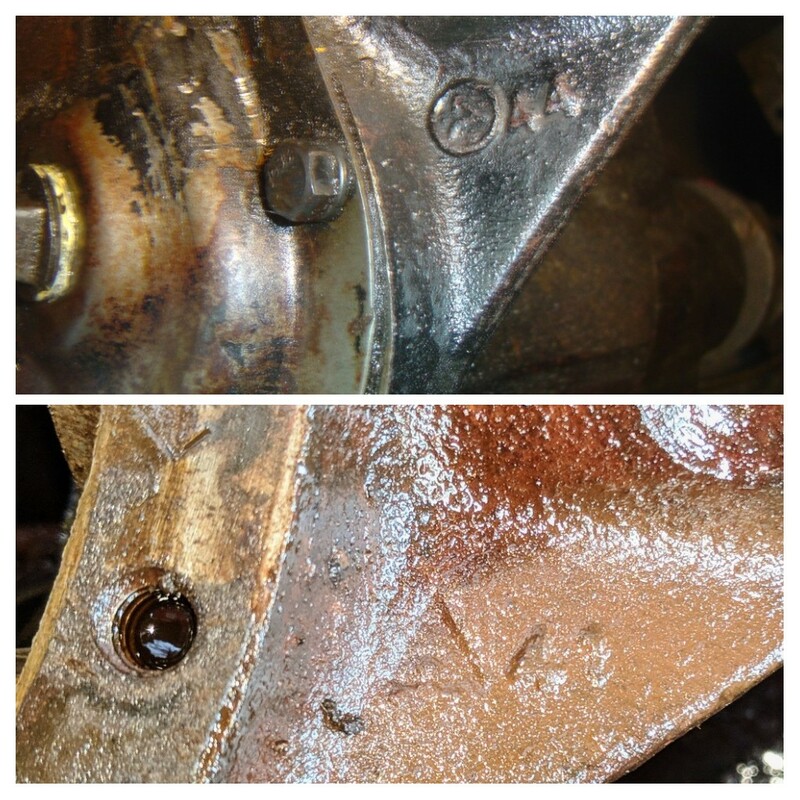 Rob’s photo above shows both rear covers for the 2 Salisbury variants, and a Dana 44 would use the same cover. 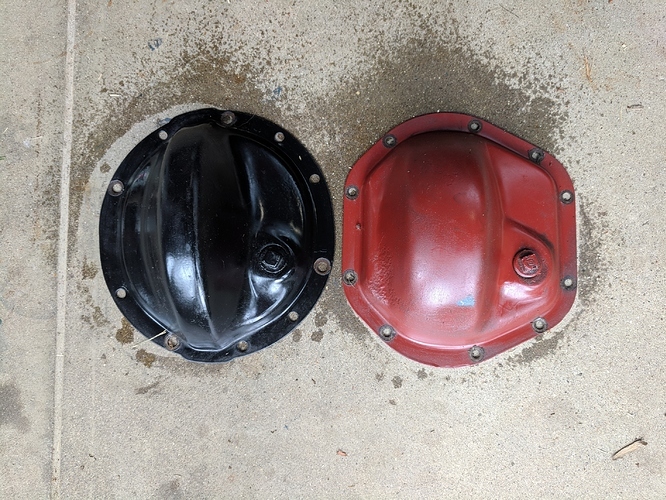 If yours looks like the one on the right (red primer) then it is either a Salisbury 4HA or a Dana/Spicer Model 44. Other than the ring gear bolts, there is very little difference between them. I have never had it open…so only have exterior details. I don’t see any reason it would not be a Dana 44. The 44 cast into the rib is pretty typical. 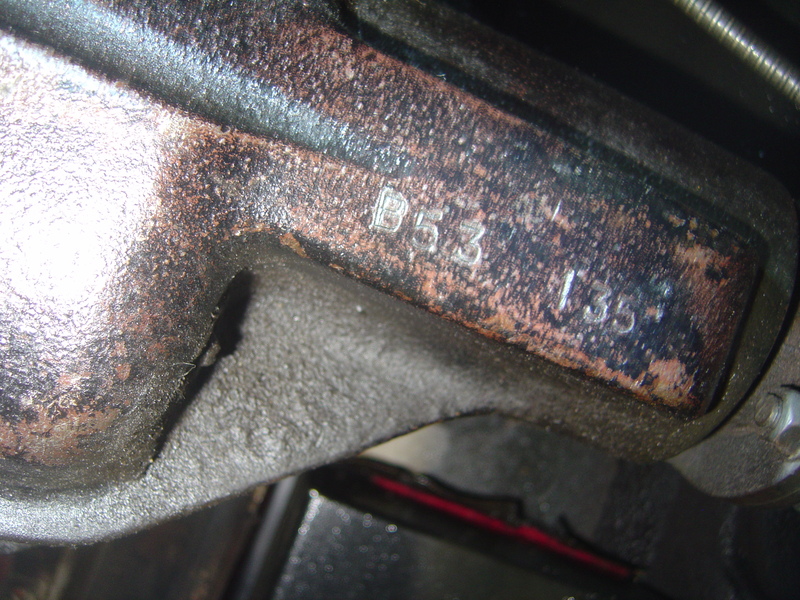 The markings on the rear cover bolts are identical to those I removed from a Salisbury 2HA equivalent removed from a 1950 Studebaker. You would think it would obviously be a Dana production, but everything inside is stamped Salisbury. Do you also have two-piece axle shafts? i.e. is the wheel mounting flange is retained by a large central nut? 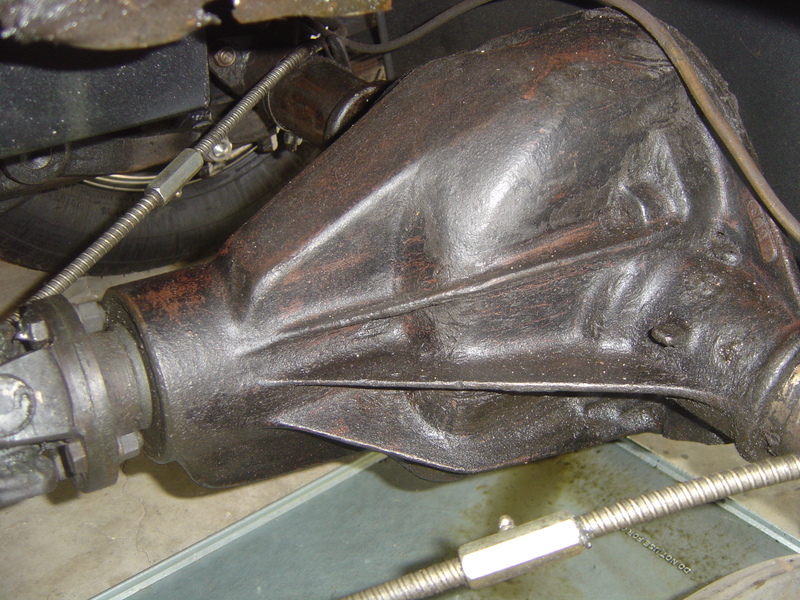 So long as you use the correct ring gear bolts, and it is poor practice to reuse them, I dont see a problem with the Dana 44 makings. All of the bearings should be the same as a 4HA. So it looks like you have a Dana 44. 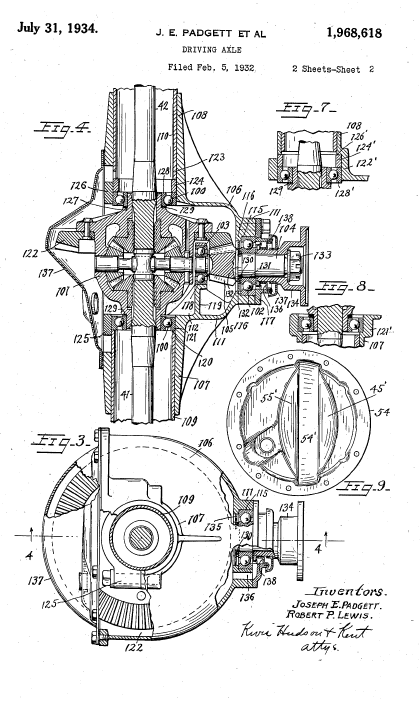 Searching those patent numbers, I find we discussed this once before on this forum. Now we have better confirmation. 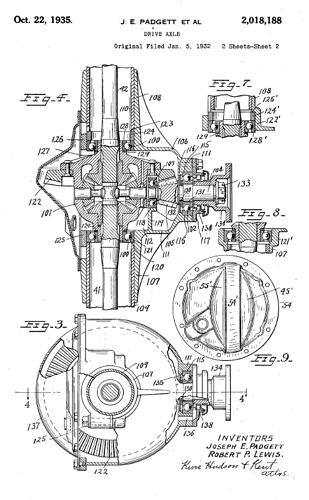 The Salisbury axle originated with Charles Salisbury of Jamestown New York in 1901. 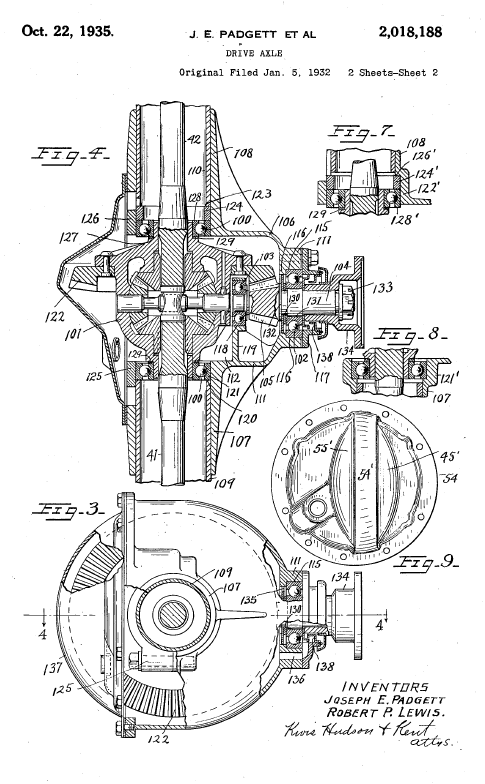 Clarence W Spicer, inventor of the Hardy-Spicer u-joint, partnered with George Dana and acquired Salisbury in 1919. When last I checked we are still looking for a Dana equivalent of the 2HA for those of us that have them. 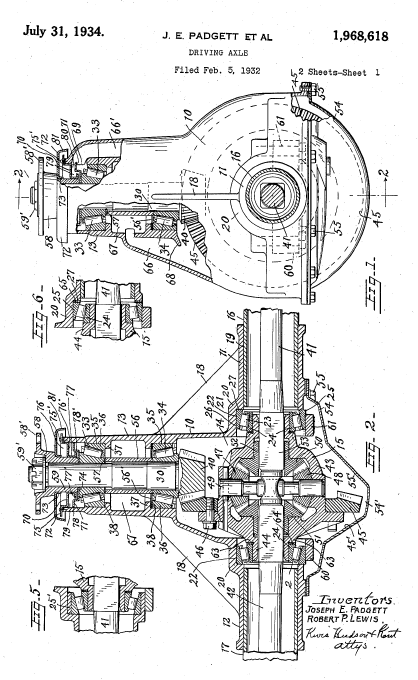 Now that I look at these patent drawings more carefully, I see that they are not hypoid axles, they are an earlier version called spiral bevel, where the axis of the pinion gear intersects the axis of the crown gear. On the underside of nose is stamped B53 135. Manufacture date code?? as was on the Leys marked diffs? So if we agree that the A44 mark identifies a DANA 44, would not The A41 mark indicate a Dana 41? So A44 = 4HA and A41= 2HA.